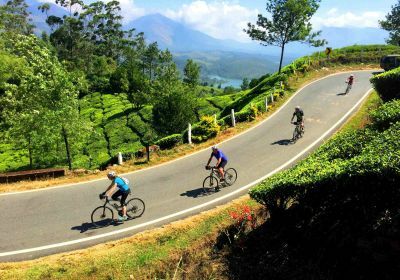 Our North to South Sri Lanka cycling holiday starts in Colombo on Sunday. We appreciate that people join redspokes tours from all over the world. No matter what time you arrive at the airport on the tour start date, you and your luggage will be transferred to the joining hotel. Please bear in mind that if you arrive before midday you may have to wait for your room to be made available. If you decide to arrive before the tour start date redspokes can assist you in booking your extra accommodation and transfer to your hotel at an additional cost. Our holiday price does not include your international flight. Our cycling holiday ends in Kandy. We can help you arrange a transfer to the airport for an additional cost. If you decide to stay beyond the last day of the tour redspokes can help you organise extra accommodation and transfers to the airport if needed. You must be in possession of a valid passport and visa. Your passport must be valid for at least 6 months after date of arrival or 1 month after expiration of visa. Visitors to Sri Lanka for tourism purposes must obtain an Electronic Travel Authorization (ETA) prior to arrival or on arrival to Sri Lanka. Holders of ETA obtain a visa on arrival that is valid for 30 days. There are no compulsory vaccinations for foreign visitors although it is strongly recommended that you be vaccinated against Typhoid, Tetanus, Polio and Hepatitis A. You should contact your doctor at least 3 months prior to travel to obtain these vaccinations and the latest advice to travellers. All of the time you will have the security of a back-up vehicle; either a jeep or a bus. The vehicle will carry our entire luggage (we transport your main baggage by support vehicle from each overnight stop to the next) and yourself if you want. The back up van will be with us throughout the day stopping around every 15 miles. Our leaders carry a good tool kit and will help to fix any bike problems so all you normally need to carry is a daypack, for your camera etc, however, we cannot guarantee that we will be equipped for all repairs, so you must ensure that your bike is in good working order before the tour. Have it fully serviced by a bike shop before you travel. Our bikes are fitted with standard flat pedals. If you would like to bring your own pedals, clips and saddle and fit them to the hire bike you are welcome to do so. We recommend you wear a helmet on the tour but we do not hire out helmets so you will need to bring your own. Most roads in Sri Lanka are in good condition. A lightweight mountain bike or hybrid will be suitable for the tour. Please ensure that your bike is in good working order before you leave for your holiday. If you are not the most mechanically minded we suggest that you get your bike looked at by a professional bike mechanic. In particular we would suggest checking all wheel spokes, greasing all your bearings, checking your brakes/gears cable, tighten all nuts and bolts, check chain, quick release clamps, tyres and put in new inner tubes and check wheel rims are not worn. In addition make sure the bike is well serviced and ride it with as much care and attention as possible. Use good quality tyres. If you are bringing your own bike you will be expected to carry sufficient spares and tools to deal with punctures and minor repairs. We would advise the following tools to accompany you on your tour: multi-tool, tyre levers, pump, 2 spare inner tube, spare spokes of the correct length to fit your wheels - check with a bike shop, brake pads, a few spare links for your chain, spares for any unique or high-tech items on your bike, e.g. fluid and bleed kit for hydraulic brakes. An accurately calibrated cycle computer is advisable. Your bike (in its cardboard box) will weigh 15 to 18kg. So, that means you will have a small allowance for clothing, etc. You should carry small heavy items in your daypack / pannier which you can take onto the plane as hand luggage. The Sri Lankan currency is the rupee (Rs), divided into 100 cents; pricing in cents is rare. Rupee coins come in denominations of one, two, five and 10 rupees. Notes come in denominations of 10, 20, 50, 100, 200, 500, 1000, 2000 and 5000 rupees. Tipping: (Guide and support staff) Understanding the etiquette around tipping local staff can be a difficult area. Tipping is entirely voluntary but an accepted part of tourism. It is at your discretion to tip as you see fit, however we recommend that each cyclist consider a contribution of between 4-6 USD per day depending on your group size. 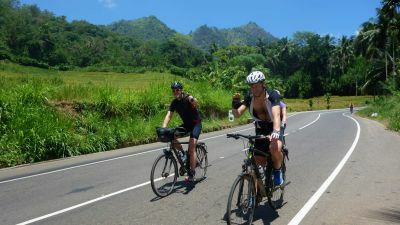 For a 14 day tour this would be between $55 - $65 per cyclist. In most countries, there is a hierarchy when it comes to gratuities; so as not to cause offence, of the pooled tips, the guide should get 40%, the driver(s) 35% and the helper(s) 25%. January to March in Sri Lanka is the warm sunny season although cooler in the hill country. April is very hot - with temperatures at least in the mid-30°Cs. Avoid the hottest hours of the day (11am-3pm) when sightseeing. The gentle south-west monsoon with short lived sharp showers blows through May and June, affecting the south-west areas such as Colombo and Galle. July to September is "inter-monsoon" season, with the odd shower. Temperatures remain high (29°C average) beaches are hot and dry. The north-east monsoon, the heavier of the two monsoons blows in October and November affecting the whole country. This monsoon is unpredictable; it can be stronger, lighter or more infrequent that in the past, and sometimes does not arrive. December is usually a nice, hot and dry month across the island but monsoon rains can last into December. 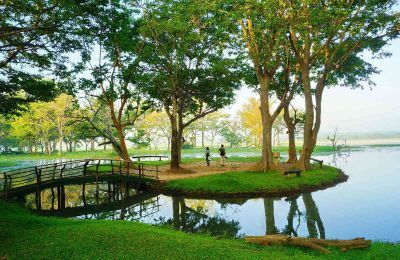 It is an exceptionally beautiful time to enjoy the lush green landscapes in rural areas. It will be hot and humid in the lowlands (daytime temperatures up to 30°C) and cooler at higher elevations (daytime temperatures up to 21°C). Sun cream is very strongly recommended. Head and eye protection are also essential. A light windproof/fleece may be necessary in the evenings when visiting hill stations and for early morning descents. Modesty is expected in towns and small villages and temples. It is important to have some baggy cycling shorts/ loose cover up shorts, to avoid causing offence. Women should cover their legs and shoulders when not cycling (a beach wrap is ideal for this). In terms of clothing this is clearly up to you and we can only supply a rough guide as to what to take. This guide is entirely flexible and should be tailored to your specific needs. Sunglasses, lightweight trekking boots/shoes, cycling footwear, lightweight socks (3 pairs),heavy socks (1 pairs), underwear (4 pairs), lightweight trekking shorts, padded cycling shorts (2 pairs), shorts, t-shirts (2), lightweight, long-sleeved shirt, fleece jacket/pullover, biking jacket, waterproof (breathable fabric), fingerless biking gloves, spare laces, sunglasses, toiletries, basic first aid kit, towel (small), small padlock, 2 large plastic bags (for keeping items dry in your bag), sun cream, lip balm. If you have any questions about this list please feel free to contact us. Maps of Sri Lanka are available from all good map shops. Some of the minor roads we use will not be shown. Rooms will be in mid-range/good hotels or guesthouses with air conditioning or ceiling fans and en-suite facilities. All room prices are based on two people sharing. A typical Sri Lankan meal is based on rice and curry. Central flavours include coconut, chilli, curry leaves, cinnamon and garlic. There is an abundance of fresh seafood and fish. Breakfasts and evening meals will be taken at the guesthouse/hotels. On moving on days the support crew will provide light lunches. Mineral water will be paid for from a kitty. All vehicle transfers to and from airports and vehicle support with baggage transfers are included in this tour. You will have the services of an English-speaking guide throughout the tour along with all visits/trips as per the itinerary. The trip does not include: your international flights, some meals in transit, and on rest days. (Light lunch and refreshments will be provided by our back up crew on moving on days), drinks, including mineral water, other than those supplied with meals, visa costs ($30), gratuities (these are at the discretion of the tour participants), any other personal expenses, travel Insurance. Sri Lankans give visitors a warm welcome. They are open and friendly and expect the same in return. Listen politely to people's views and advice. Do not point at others as pointing is considered a rude gesture. Smoking in public places is not permitted; most hotels, bars, and restaurants will have an allocated smoking area (usually outside). Keep calm. Raising your voice, or becoming angry will result in nothing other than you becoming embarrassed. If you dine with a local family, it is traditional to eat with your hands. Use your right hand only, ask your hosts for guidance if needed. Remove your hat and shoes when visiting a Buddhist or Hindu temple; cover your shoulders wear below-knee trousers or skirts not shorts. Beachwear is inappropriate and can cause offence. Walking barefoot around temples on hot stone floors can be difficult it is acceptable to keep your socks on. In some Hindu temples, non-Hindus aren’t permitted to enter the inner shrine; in others, men are required to take off their shirt before entering, and women are sometimes not permitted entry at all. Religious statues are sacred. Do not climb on or sitting by one, and don’t pose for a photo with a Buddha image. In some temples (Buddhist and Hindu) you will be shown around by a monk or priest and expected to make a donation. At other places, unofficial “guides” will offer to guide you – for a fee. Try not to feel pressured into accepting the services of unofficial guides unless you want them. "Wow! Where do I begin. redspokes you’ve done it again! We had such an amazing time. From the train ride to Jaffna to our arrival in Kandy. It was such..."